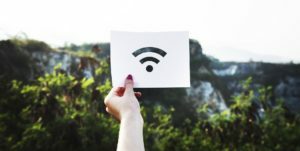 These tips won’t increase your connection speed, but might help if you have black spots in the building where you cannot get a signal. Your router transmits your WiFi signal. Just like radio waves, noise, or ripples in water, the signal gets weaker over distance. If you’re blessed with a large living space, then the more central location is obviously best to make sure the ‘ripples’ reach every corner of the property. It might be tempting to hide your router away in a cupboard or unused room, but that’s just extra walls for the signal to travel through. It’s worth working out a central location with as few barriers as possible to see if that helps. This sounds like it’s too good to be true, but apparently you can get a tiny signal boost by creating a tin ‘sail’ around your router’s antenna. It’s unlikely to boost the router range significantly, but some people have reported slight improvements so, who knows, maybe it’ll work for you! If you’ve tried moving your router around with no luck, or if you need an especially wide range (for example if you’d like to be able to get a signal by your pool) then you should think about a WiFi range extender like the Amplifi. These work by increasing the signal radius – it will reach devices that are further away. They’re not expensive and have no ongoing costs. All you have to do is plug it in and keep using your devices as normal. If you want to talk to us about WiFi range extenders, or any of our other products, then get in touch – you can email sales@telitec.net, use the ‘Tell Me More’ form on this page, or call 965 74 34 73 or 902 889 070.